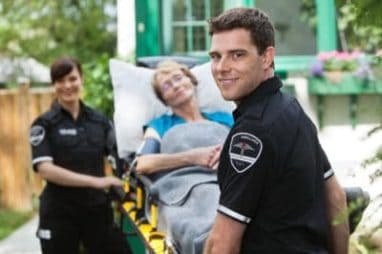 May 18-24 marks the 40th annual Emergency Medical Services Week. President Gerald Ford authorized the first EMS Week celebration in 1973 shortly after Congress passed the Emergency Medical Services Act. Since the first celebration, the week has focused on recognizing and honoring EMS practitioners as well as spreading awareness about injury prevention. EMS Week is the perfect time to teach your kids about safety and to show thanks to the EMS personnel who are dedicated to serving your community. Showing gratitude to EMS personnel this week is important. You can show gratitude by participating in a memorial event or by learning more about the history of EMS. Another part of EMS week is spreading awareness about injury prevention. EMSC Day falls on the Wednesday of each EMS Week, and is dedicated to raising awareness about the aspects of EMS that are unique to children. To celebrate EMS Week this year, try one or all of these activities with your kids to teach them about safety in a fun, engaging way. This virtual museum holds an archived collection of items that tell the history of EMS. With exhibits featuring ambulances, EMS communications, personnel and equipment, this virtual collection is a valuable resource for learning about EMS history. Children may enjoy watching the videos featuring antique ambulances and equipment, while adults may find enjoyment perusing the historical EMS-related articles and publications. No matter where you go in the National EMS Museum, you’re sure to learn something new about EMS. Parents can find more bike safety information on the Safe Kids Worldwide website or from the National Highway Traffic Safety Administration. Once you’ve taught your kids the importance of bicycle safety, your family will want to get out and ride! If you live in Kentucky, Colorado, or on the east coast, consider participating in the National EMS Memorial Bike Ride. This bike ride has been organized to memorialize the lives of EMS personnel who have served their communities and to raise public awareness about safety conditions for EMS personnel. Participating in this event will honor EMS personnel and spread awareness. More information, including details on the three different routes and how to register for the event, can be found on the event website. If you’re unable to attend the memorial ride, you can still get out on your bike to enjoy the spring weather and memorialize EMS personnel in your own way. This fun project from the American College of Emergency Physicians is all about teaching kids the importance of seat belt safety. Because it’s a great activity and learning experience, we want to share this project with you here. In this project you’ll construct a car out of household materials and send it down a ramp with an egg in the seat to help teach kids about safety belts in cars. While they’ll have fun watching the egg smash against the wall when it’s not buckled in, they’ll also see the danger of not wearing a seat belt. When they send the car down the ramp a second time – this time with the egg strapped in – they’ll see that the belt keeps it safe. This project is a good way to make a scary subject, like injury from a car accident, accessible for children to learn about. The full instructions for the Eggmobile are available as a PDF file on the ACEP’s Children’s Outreach Activities page. EMS week is all about honoring and thanking EMS personnel in your community and spreading awareness about injury prevention. Another great way to honor a person in your community is to donate your used or unwanted car, boat, RV, or motorcycle to Wheels For Wishes benefiting Make-A-Wish. Your donation will help grant wishes for children with critical illnesses in your community. Donating a vehicle is easy and comes at no cost to you. Simply fill out an online vehicle donation form or call us today at 1-877-431-9474, where our experienced car donation representatives will guide you through the process and answer any questions you might have. Whether it’s through saying “thank you” to EMS personnel or through donating your vehicle to Wheels For Wishes, you can make a positive difference in your community this week!